Blockchain is an emerging technology that has been heavily betted on to revolutionize the way transactions are carried out today. Blockchain is a practical concept that makes the transections faster, economical, secure and transparent. The first blockchain was conceptualized by Satoshi Nakamoto in 2008 and implemented in the following year as a core component of the digital cryptocurrency currency bitcoin. Bitcoin serves as the public ledger for all transactions. Bitcoin was the first digital currency to solve the double spending problem, without the use of a trusted authority or central server.The following infographic gives a number of use cases of blockchain in non-financial sectors. In general, blockchain can be used in any domain which involves transactions. Recently, Honduras government has put all land records in the country on a public ledger – the blockchain. Whenever there is a change in ownership, it gets recorded and is made publicly available. Some of the most recent implementations of blockchain are in thwarting diamond thieves and streamlining stockmarkets. In this article, we are going to focus on the impact of blockchain on the banking and finance sector. A blockchain is a public ledger of all transactions that have ever been executed. It can be thought of like a huge number of blocks that has been arranged in chronological fashion within a chain. The chain constantly keeps growing as new completed blocks are added to the chain. Each node or computer within the network downloads a copy of the blockchain at fixed intervals of time. The blockchain has complete detailed information about transactions that has ever been created including details like the Sender ID, Receiver ID, transaction amount, timestamp and unique reference ID of each transaction. Thus, every node in the network has access to all the information on the transactions that has taken place. It makes sure that there is no requirement of third parties like central bank or other intermediary for establishing trust and verifying transactions. Therefore, the trust between the sender and receiver in the case of blockchain is decentralized. •Speed: Today, an email can be sent over internet within a second but it takes several days for transferring money only because of these third parties involved in the process. This can be fast tracked if there is no necessity for these third parties. •Economic: Not only does these third parties slow down the transaction process but they also take a significant portion of it as their fees. •Security: If the records are centralized as is the case with the banks and governments, they can easily be hacked or manipulated. While if they are encrypted and decentralized across the network as is the case in Blockchain, it is not possible to do so. •Transparency: The blockchain process is incredibly transparent and therefore being used by some of the governments for tasks like maintaining land records that are publicly available. In 2008, an anonymous person or persons named Satoshi Nakamoto created a paper where he developed a protocol for a digital cash that used an underlying cryptocurrency called Bitcoin. And this cryptocurrency enabled people to establish trust and do transactions without the need of a third party. The underlying technology behind bitcoin is blockchain. The following graphs shows the increase in tranactions on bitcoin and at the same time price of bitcoin reached $2715 on 23/06/2017. Bitcoin has been able to create trust between the sender and receiver without the need of centralized third party trust mediators. 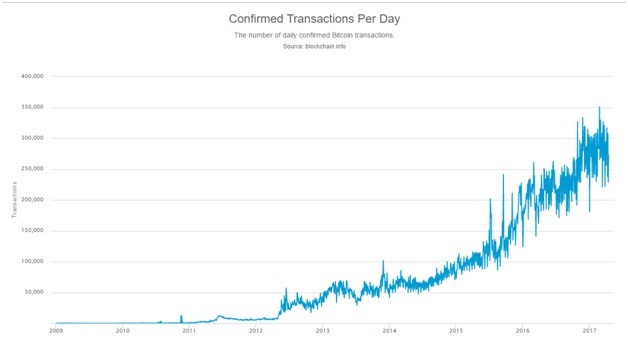 The consistently rising number of transactions using bitcoin over the years in the above infographic is a just a reflection of that. A database that contains the payment history of every bitcoin in circulation, the blockchain provides proof of who owns what at any given moment. This distributed ledger is replicated on thousands of computers which are called bitcoin’s nodes around the world and are publicly available. But even for all its openness it is also trustworthy and secure. At the interval of every 10 minutes, a new block is added to the blockchain. A case that frequently occurs is that the records present within the nodes in the network are not all same. In this case, the settlement for decision on which one is the genuine set of records is taken on basis of solving a computationally expensive complex mathematical puzzle. This process is a sophisticated version of simple techniques like majority voting made to favor the majority. So, if one node corrupts the records and want to prove that the corrupted records are actually true, then it has to have the computational power to beat the combined computational power of all other nodes in the network which is not a practical possibility. How is Blockchain impacting Banks? Recently, there has been a major shift with in the stance ofbig banks who are now planning to adopt the blockchain technology to make their transactions cheaper, faster, efficient and reliable. Infact, IBM report titled “Leading the Pack in Blockchain Banking: Trailblazers Set the Pace.” Claimed that banking and financial markets are adopting the technology “dramatically faster than initially expected”. IBM claims that within next four years 66% of banks are expected to have blockchain in commercial production implemented at scale. Eight major banks including HSBC and State Street has already successfully tested out blockchain in bond transactions earlier this year. While UBS and Santander have been trying out the technology for cross-border payments. Also, Bank of America announced a partnership with Microsoft to experiment with the system. Most of the banks are focusing on using blockchain technology for improvement in three key areas: consumer lending, retail payments, and real-time information sharing of transactions across business divisions and institutions. Colu is a leading Israeli startup focused on using their Blockchain platform for tracking music rights and distributing royalties to rights owner in a transparent manner. Synereo is another Israeli startup working on creating of blockchain enabled decentralized computation platform that could run an entire array of decentralized applications. Digital Asset is a software company that builds distributed, encrypted systems for implementing blockchain.Digital Asset is backed by software companies and banks like IBM, Accenture, JP Morgan, Goldman Sachs and Santander. Headquartered in New York city, R3 is a distributed database technology company with more than 70 of the world biggest financial institutions in research and development of blockchain database usage in the financial system. Headquartered in Singapore, Bluzelle is a blockchain service provider focused on the use case of payments, insurance and KYC. With clients like Standard Chartered and DBS, Ripple is a distributed financial technology allowing banks around the world to directly transact with each other. Hyperledger is a global collaboration, hosted by The Linux Foundation, including leaders in finance, banking, IoT, supply chain, manufacturing and technology. It is an open source collaborative effort created to advance cross-industry blockchain technologies. Fluent was founded in 2014. It provides a real-time, low-cost, simple and secure invoicing and payments system for global supply chains based on blockchain technology. Their system is created to be used primarily by banks and financial institutions. Provenance is focusing on applications of blockchain in product supply chains.It is aiming to give every physical product a unique digital identifier which will be used for having an auditable account of the journey behind all physical products. Thus, creating far greater transparency and trust by preventing the selling of stolen or fake goods. Skuchain builds blockchain based products for B2B Trade and Supply Chain Finance. With a strong team of serial entrepreneurs from Stanford, MIT, Berkeley and UPenn, they are aiming to help enterprises break free from the complexities and costs associated with their Inventory and bring forth the vision of ‘Collaborative Commerce’ where trade partners can interact in a friction ­free manner and gain deep visibility into their supply chain so they can make smart forecasting decisions, and not be constrained by cash flow helping them compete.